Thursday was getaway day and I was a little upset that it was a 4:05 start and not the usual 12:35 first pitch that the Pirates have for series finales. It did give me a few additional hours between Wednesday’s night game though so it wasn’t all bad. I had breakfast at the Bagel Factory again and then returned to the apartment to work on the blog. I also sent out some emails and tweets to Washington D.C. TV and radio stations to see if they’d be interested in doing an interview. The Nationals just clinched a playoff spot (and there’s a lot to discuss) so I don’t think I’ll be getting an interview. I left at 2:20 and parked at the same garage on Sixth street that I did for the previous five games in Pittsburgh. Since it was an afternoon game (and still within business hours) parking was $9.75 as opposed to the event rate of $5, darn. I got my ticket from will call and was inside the park by 3:05. The Pirates have some statues inside the left field entrance but this one stands out. It’s a casting of Ralph Kiner’s hands. Kiner played for the Pirates from 1946 to 1953, made the NL All-Star team six times in those eight years and won the home run title seven times. His number 4 is retired by the Pirates. 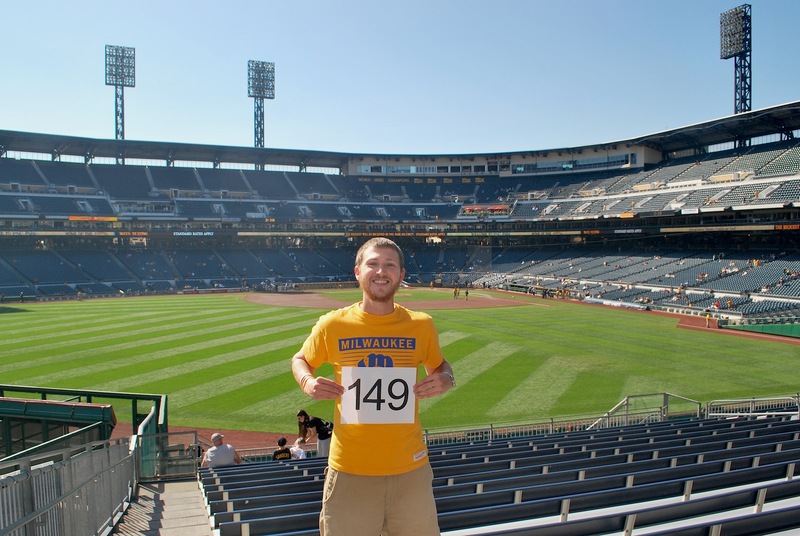 I went to the upper bleachers in left field for game photo number 149 and a very nice woman took the picture for me. I also had one taken from above the visitor’s dugout and I think I like it better. 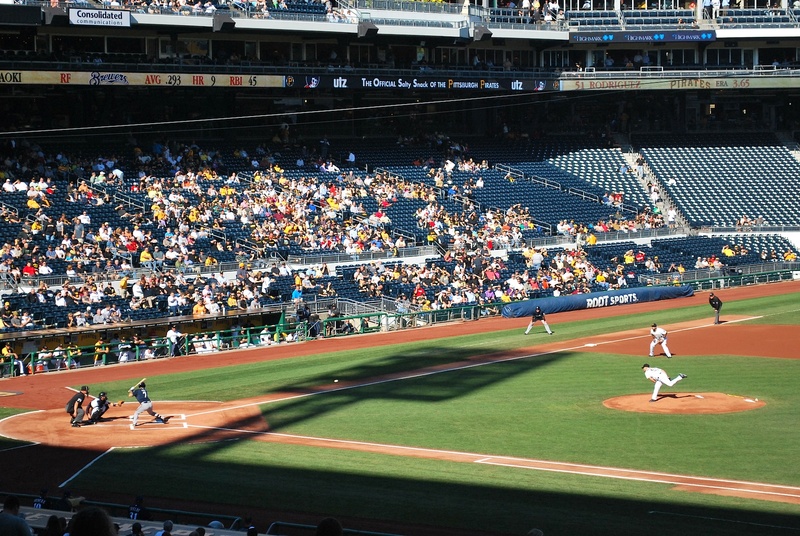 While the one from the outfield provides a different angle than the previous 5 at PNC, it’s kind of boring. I like that PNC Park is readable in the second one. 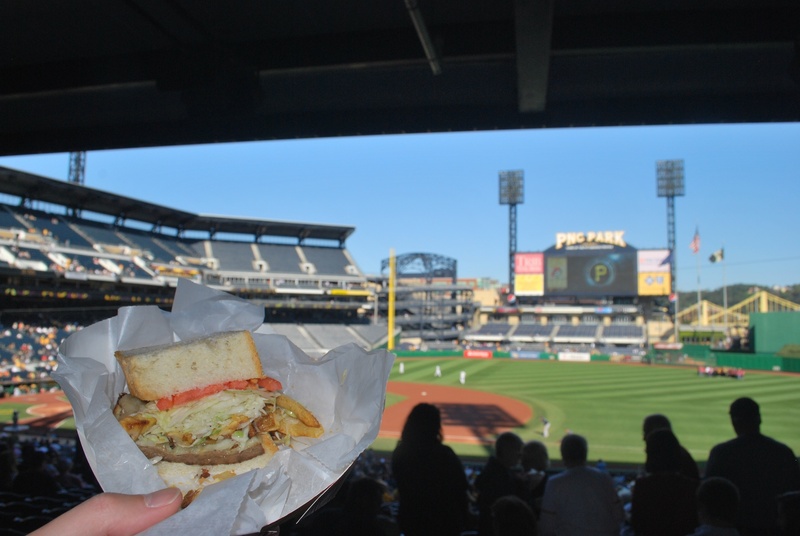 I was hungry and PNC Park has a Primanti Brothers on the field level concourse. I went with the “Pittsburgher” which is what I had on August 25th when I went to the original Primanti Brothers in the strip district. I ate half of it and then took a picture of the remaining 50%. $7.75 is more than what you’ll pay at one of the restaurants outside of the park, but considering the other options and their prices; it’s a pretty good deal. 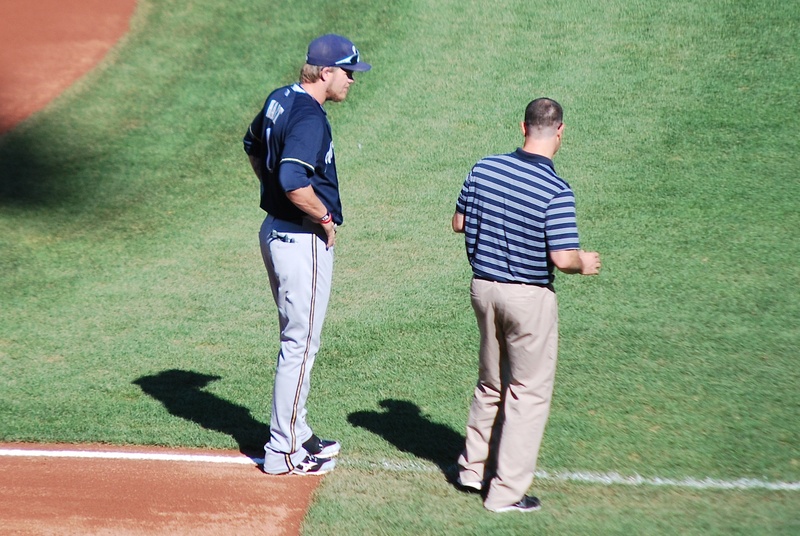 Corey Hart was in the lineup for the first time since September 9th and it was nice to see him out on the field before the game. He was talking to the trainer as he did his pre-game stretches. You could tell he was in pain when he (gingerly) ran into shallow centerfield and back. On-going plantar fasciitis has been the reason for his absence from the lineup. 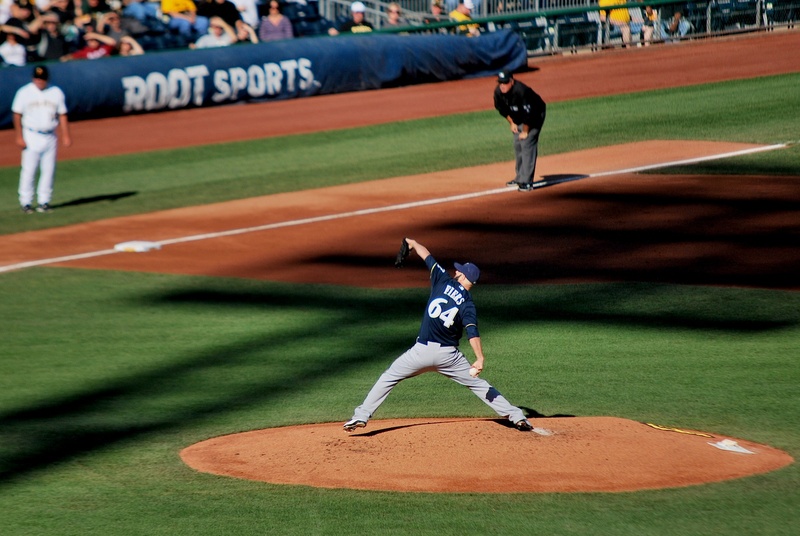 Hart played exactly one half of the game, with Ishikawa entering at first base after the top of the 5th inning. 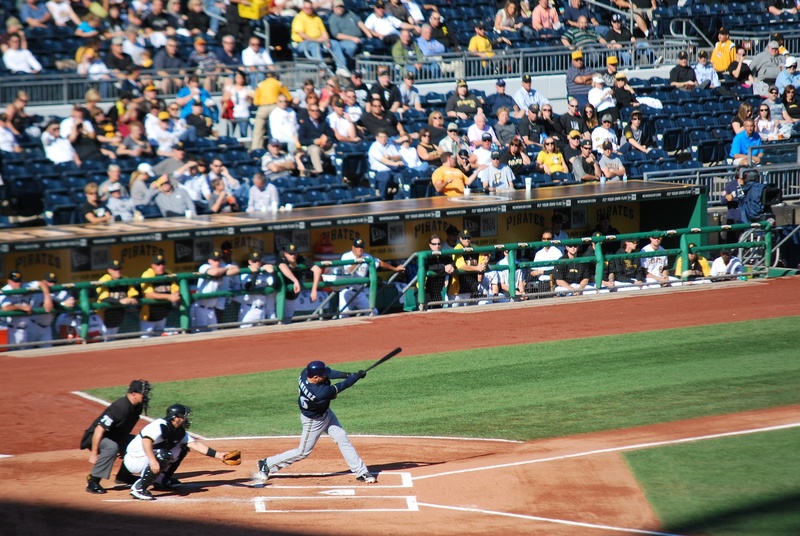 The game started and Aoki took a called strike from Pirates starter Wandy Rodriguez. This was the view from my seat in section 108. Aoki singled on the next pitch and then stole second with Weeks at the plate. He moved to third on the play because of a throwing error charged to the catcher. 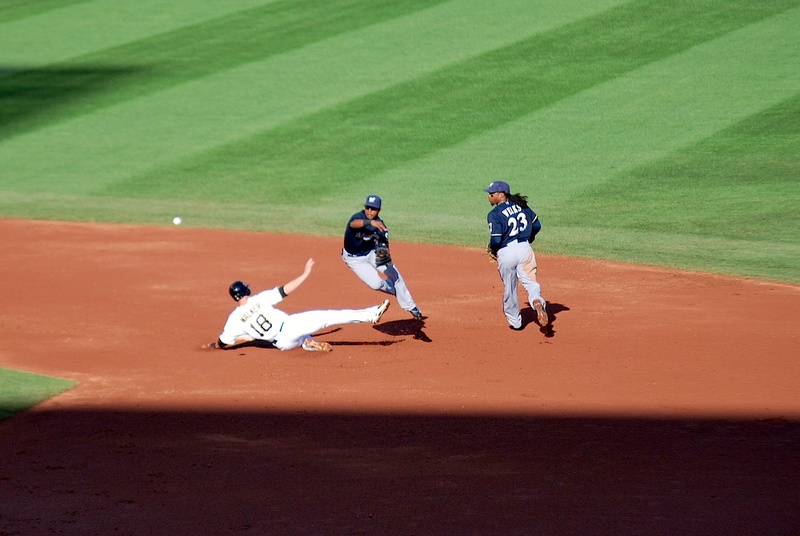 Weeks walked and Braun grounded one to short that should’ve been a double play. 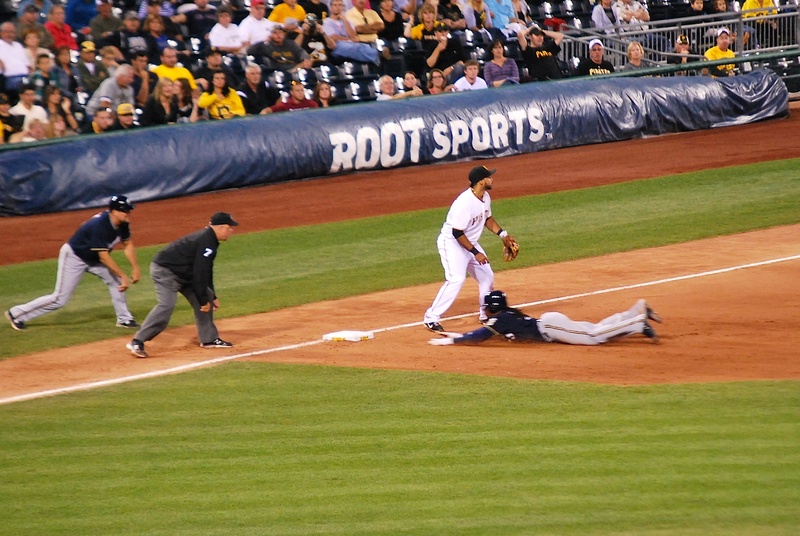 The shortstop Barmes bobbled it briefly and they were only able to get Weeks at second, with Aoki scoring on the play. Ramirez stepped in and lifted the second pitch he saw to center and deep. It bounced on the top of the wall and over for a two-run home run. I’m pretty sure the ball is out of the frame on the first picture below. 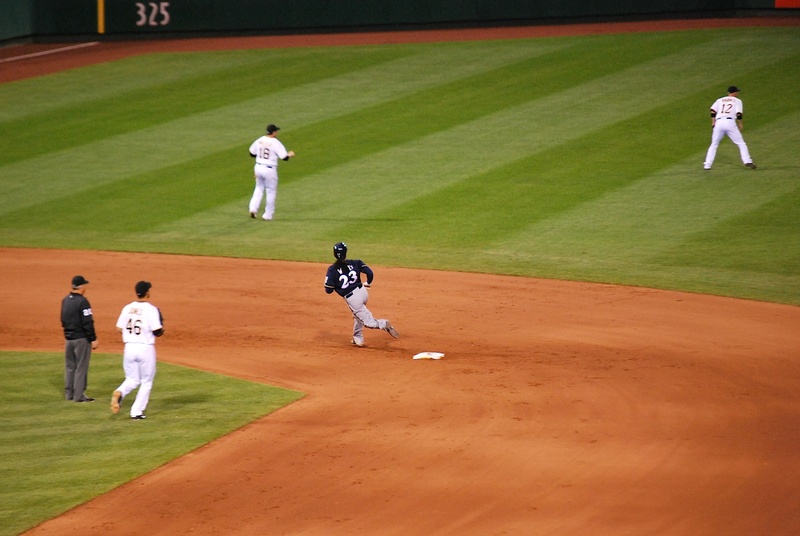 Fiers was helped out in the second by a 4-6-3 double play. Weeks made the glove flip to Segura and he let it fly while leaping over the takeout slide of Neil Walker (it’s my favorite picture of the day). 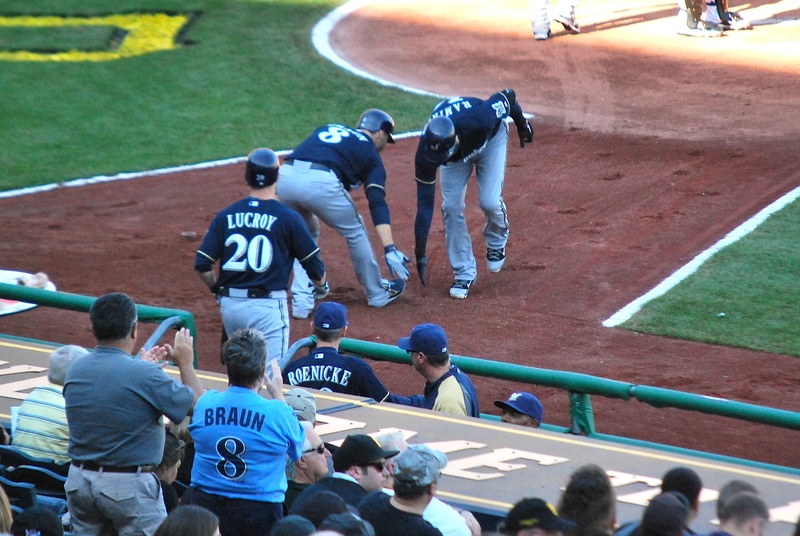 In the top of the third the Brewers caught a break as Aramis Ramirez was called safe at the plate on a sacrifice fly despite never touching the plate. Starling Marte made a great throw from left and Ramirez didn’t slide. He stepped on Rod Barajas’ foot and not home plate but the umpire called him safe. I’ve voiced my opinion on instant replay before so I won’t go on a rant but I think if you can get the calls right at home (beer in hand on your couch) within 15 seconds of the play major league baseball should adopt this “amazing technology” that is instant replay. The 4-0 lead didn’t last long and in the bottom of the 3rd Andrew McCutchen hit a three-run home run to cut the lead to 4-3. McCutchen had a great year against the Brewers (and a lot of other teams for that matter). In 15 games vs. the Crew he hit .322 with 6 home runs and 16 RBI. If you make projections over a 162 game schedule he would have had 65 home runs and 173 RBI. Not bad at all. The Pirates tied it in the bottom of the 4th but it could’ve been much worse. The bases had been loaded with nobody out so only giving up one run feels like a win in that situation. 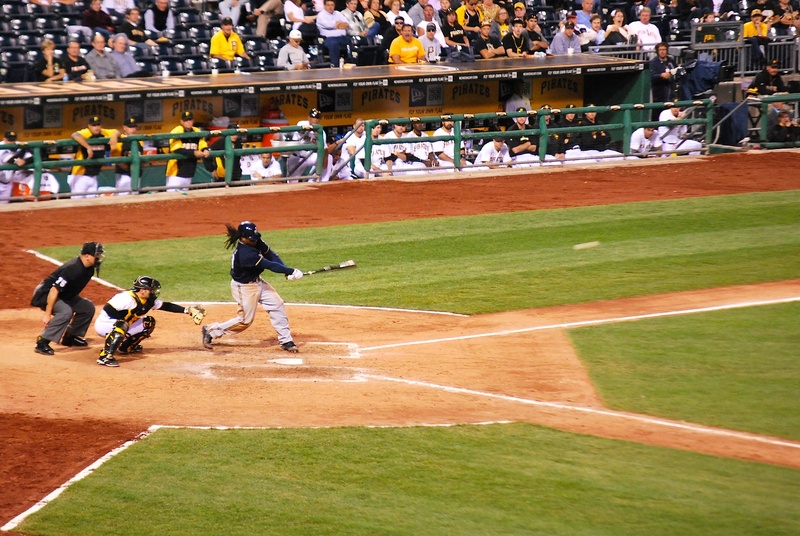 It remained tied at four until the 6th inning, when the Pirates scored three times to take a 7-4 lead. It was looking bleak and the fact that the Cardinals had already won made it more depressing. 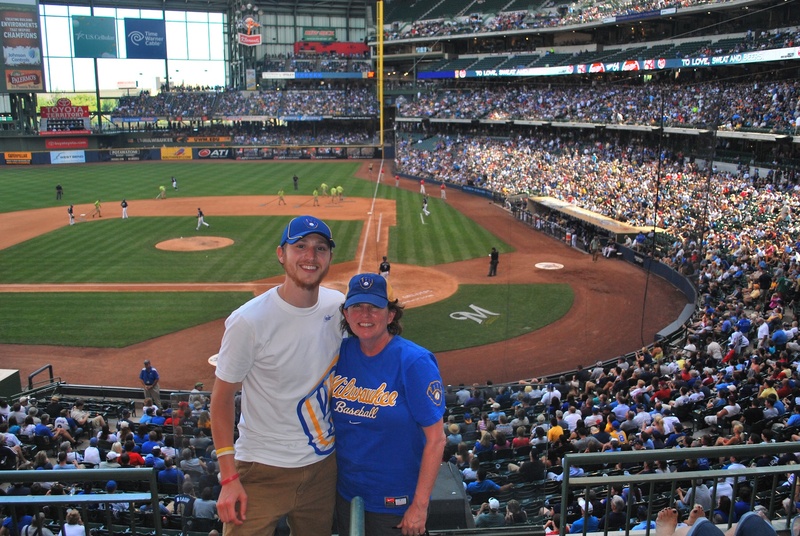 A loss would put the Brewers 3.5 games back with only 13 to play (3 back in the loss column would’ve been the important number). The ball didn’t get much higher than where it was in the picture above. It’s peak was likely somewhere around 10-12 feet and it went all the way to the wall that’s 410 feet away!!! Strong. Like. Bull. THAT’S WHAT I’M TALKING ABOUT!!! The two-run triple tied the game at seven. 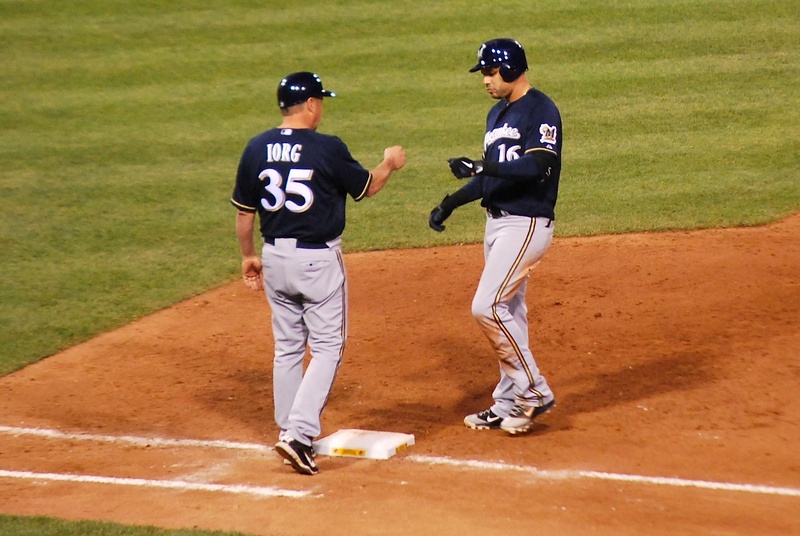 Braun was intentionally walked to set up a potential inning-ending double play. Ramirez snuck the 1-1 pitch up the middle for the go-ahead RBI. The Brewers added an insurance run in the top of the 9th and Axford shut the door; striking out the side in the bottom of the 9th. Sweeeeeeeeeep!!! 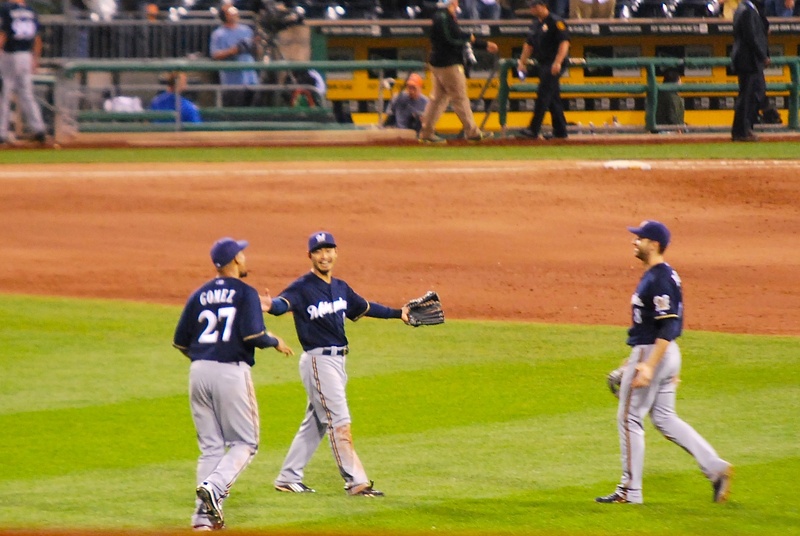 It’s a little blurry but you can see that Gomez, Aoki and Braun were all smiles after the game. Final score: Brewers 9 – Pirates 7. 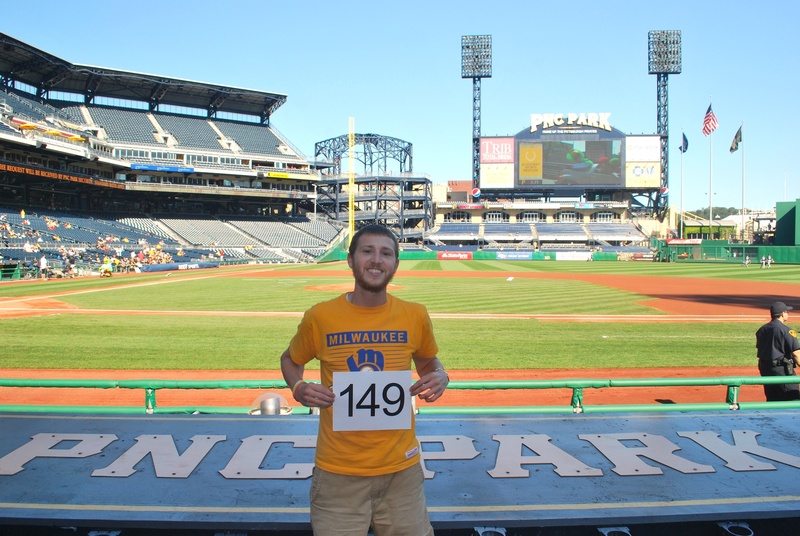 Thursday was the 49th Brewers – Pirates games I’ve attended (14 have been at PNC). The Brewers have won 36 of the 49. Wow. 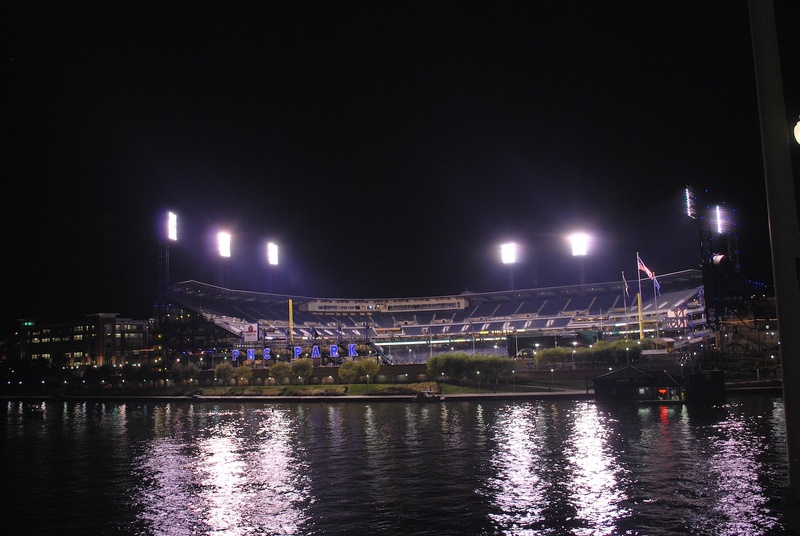 I walked across the Roberto Clemente bridge and stopped along the way to take one last picture of PNC Park. Thanks for the memories!!! I got in my car at 8:22 and started my trek to Ellicot City, Maryland. My aunt and uncle live here and while it’s not in DC it’s close enough. I can drive down to the northernmost Metro stop and take the train into the city. Now, a little pre-cursor to what happened on my drive. On Wednesday the guy at the will call window (after hearing I was going to DC) recommended I take a different route than the Pennsylvania Turnpike. I thought about it on Wednesday and Thursday but ultimately decided to take the Turnpike anyways. As I hit some minor construction including some stretches with a posted 40 MPH speed limit I started to second guess my decision. Making it worse; at some point on I-70 East (after getting off the turnpike) I came across a racoon or an oppossom crossing the road. I saw it kind of late because it was moving somewhat quickly from left to right and my headlights didn’t pick it up right away. I thought about swerving right, then I thought about straddling it but ultimately I swerved left and tried straightening the wheel (I’M AN ENORMOUS IDIOT!!!). I was going between 65 and 70 MPH and I started fishtailing. I tried correcting but my tires didn’t catch. I honestly can’t tell you what happened next but I think I did a complete 360 (thank goodness I didn’t roll my car). There was a lot of squealing tires and I wound up sliding (somewhat hard) into the guard rail on the left side of the road. Luckily there weren’t any cars near me at the time (it was about 10:35 PM). At some point during the fiasco my car shut off, and after hitting the left guard rail my car rolled back and bumped into the right guard rail. My car wouldn’t start and my front end was taking up a good chunk of the right lane. A semi approached over the hill and I got nervous. I put my flashers on and started honking my horn. My 2004 Accord is black so I wanted to make sure they saw me taking up the right lane. I grabbed my phone and called 911 (something I don’t think I’ve ever had to do before). I got out of the car at first because I didn’t want to be in there if the immobile car was going to get t-boned. I jumped back in after a few cars passed and thankfully my car started and I was able to pull over. So many things raced through my head amongst the chaos including “will this prevent me from getting to the game tomorrow?”. Yeah, I’m an idiot. If you can’t tell I choose to beat myself up regarding stupid things I do, no one is harder on me than me. The lady on the line transferred me once she learned no one was injured or in danger. As I talked to the new lady on the phone I inspected the damage, expecting to see a hanging bumper or a bent quarter panel restricting the movement of a front wheel. Luckily it wasn’t too bad but my front license plate and holder were completely torn off. I thought about going back to find it. The road was narrow, it was dark, and I didn’t feel like risking my life (without a flashlight, thanks batteries) to possibly get my license plate back. I called Victoria and then my mom to tell them I was fine (I don’t think they would’ve liked to learn about what happened by reading it). My car still ran/runs fine and I made it to my uncle Jon and aunt Candy’s townhouse just before 12:30 AM. 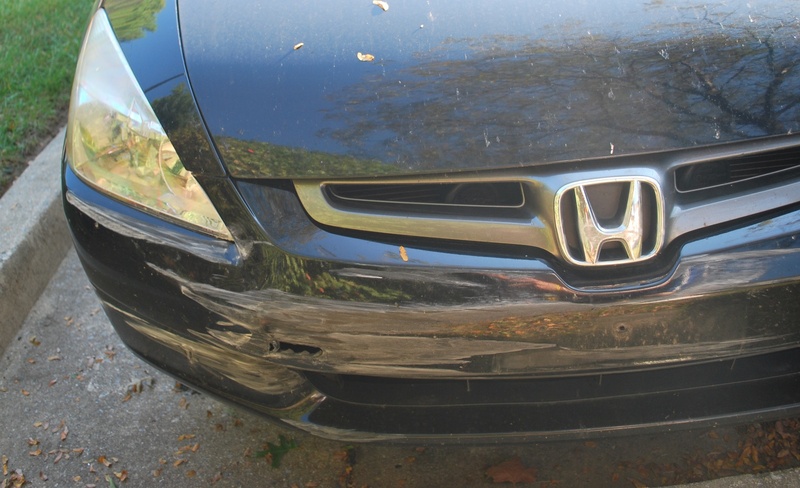 I went out and inspected the damage in daylight and it really isn’t *that* bad. I’m surprised because my neck is a little sore from when I hit the guard rail and my elbow is even more sore than it has been the past 2 months. 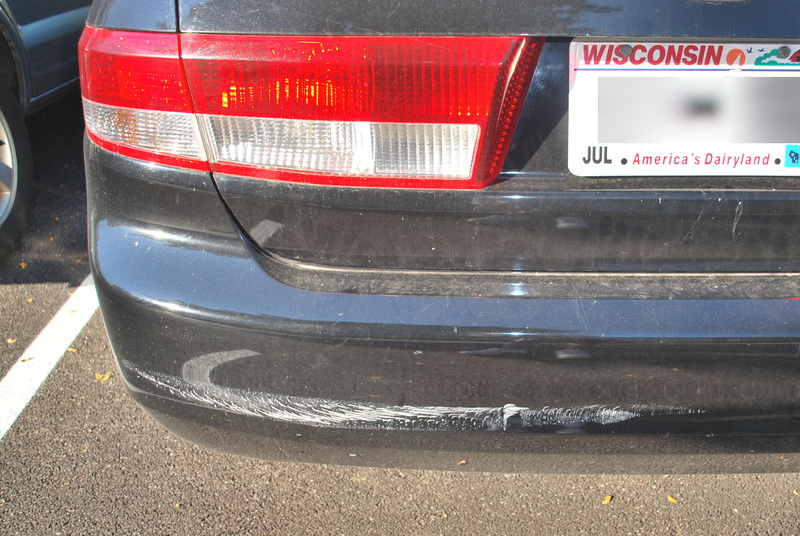 I will be getting a new license plate holder (and license plate if no one finds it and returns it), but I don’t think a new bumper is worth it. I’ve tried to be as careful as I can all season (and driving in general) because spending money on preventable accidents is a waste of money. I also think I’ll leave it to remind me of how stupid I am. I know PETA will be happy with my decision to swerve (since no one was injured in the end) but honestly I think I would’ve been fine if I had just hit the darn thing. It was decently sized so who knows what would have happened, but swerving at 65 MPH is typically not a good decision. Overall I’m thankful that I’m fine and I understand it could’ve been a lot worse. It’s 11:30 AM on Friday and I’ll be leaving around 3:00 PM to head to the park. It’s a 20 mile drive to the Greenbelt Metro station and then a 30 minute ride to the Navy Yard stop, which is about 1,000 feet from Nationals Park. I’ll be on the field for batting practice today thanks to a friend of Pam’s (John) who told me to call Kyle with the Nationals. I asked if I could get an interview to try and promote the Be The Match Registry and the Foundation, but he said they wouldn’t be able to fulfill those requests. It’s fun being on the field and all, I just feel guilty because I think I should be doing more to help Be The Match. Nonetheless; thank you Kyle for hooking me up with the batting practice pass!